Climate change is already happening and its effects, particularly on rural communities in India, are adverse. There is a need to highlight key issues and understand the practical challenges that must be addressed, if India is to build the capacities of its rural communities to robustly adapt to climate change and realise the National and State Action Plans on Climate Change (NAPCC and SAPCC). For the last four years, WOTR has been implementing a large-scale integrated project on climate change adaptation in rural Maharashtra, Andhra Pradesh, and Madhya Pradesh, in collaboration with the National Bank for Agriculture and Rural Development (NABARD), the Swiss Development Cooperation (SDC), the Indian Meteorological Department (IMD), the Central Research Institute for Dryland Agriculture (CRIDA), the World Agro-Forestry Council (ICRAF), and the State Agricultural University (MPKV). This experience has catalysed insights, lessons, and experiences from multiple stakeholders, which we have formulated as Position Papers across 12 thematic areas: Watershed Development, Water, Food and Nutrition Security, Agriculture, Livestock, Biodiversity and Ecosystem Services, Disaster Risk Reduction and Risk Prevention, Alternate Energy, Economics and Livelihoods, Health, Gender, and Governance. These papers assess and analyse the key policy and operational challenges faced in building adaptive capacities across sectors, from the perspective of different key stakeholders. The aim is to contribute towards formulation of enabling policy and operational frameworks that would facilitate effective implementation of the NAPCC and SAPCCs in rural India. They hope to trigger creative dialogues between key stakeholders, with a view to providing effective support to efforts that seek to build the adaptive capacities and resilience of rural communities. The paper ‘Livestock systems, vulnerability, and climate change – Insights from the grass roots’ attempts to explore indications of vulnerability at the grass roots. It attempts to see the impact of the logic of using technology (crossbreeding) and sedenterisation as a means of poverty alleviation/higher economic returns for livestock keepers and the rural poor. Have the poor really benefitted economically, or have we increased their vulnerability further, especially in the context of climate change? The paper urges the need to clear certain areas of prejudice against indigenous cattle, small ruminants, and poultry breeds, and proposes special policy measures for livestock production in dryland regions of India in the context of climate change, a reality that is here to stay. Rearing livestock in dryland regions has been developed by pastoralist communities over centuries as an extensive system of production. Due to its inherent bio-physical vulnerability, ’mobility’ is a critical factor. It is a complex social–ecological system (SES) with sub-systemic linkages, knowledge systems, and institutions that maintain the resilience of dryland ecosystems. When a system is assessed merely in terms of production, it does not take into account the value provided by the multi-functional nature of livestock through essential services such as transport, credit, landscape conservation, and environmental protection. High-yielding breeds have huge resource footprints. Managing the ecosystem sustainably for the various services it provides is more critical than the GHG emissions from indigenous livestock. Changes in livestock composition and rearing systems (intensification) have definitely increased the vulnerability of both communities and ecosystems for small and marginal farmers and the landless poor. The livestock breeding policy must enable in situ conservation by involving pastoralists/livestock keepers through long-term sustained initiatives. This needs to be tailored to traditional dryland farming systems. Intensification of animal production threatens the eco-system well-being. It is very risky for small and marginal farmers and the landless in the long-term. Small livestock and backyard poultry are essential for the rural poor to cope with the emerging risks of climate change. Programme measures must ensure grazing rights, particularly to pastoralist communities. Policies and programmes to protect, conserve, and regenerate common property resources need to accommodate extensive (grazing-based) livestock systems. 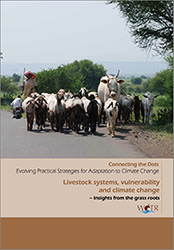 Watershed Organisation Trust (2013): Livestock Systems, Vulnerability and Climate Change, Pp 23, December 2013.